Description: MP399.0 Gnat Pond RD. Description: This could have been two weeks ago but it was actually 01APR1997 as CP 556 with five NS units passes through Fleetwood PA. Description: 13T rolls east at Waverly behind a typical mix of power, which today includes a GP 50, and a whopping 17 cars. Description: The first train Pat Scott and I caught today was NS Train 111 passing NS Train 115 in the siding north of the airport. It was nice to catch a Primer "Albino Catfish" Dash-9 before they are all painted. The first car was a Hi-Wide Load, a McDonnell Douglas Corporation well car for carrying airplane and aviation parts. Pat picked me up this morning from The Double Tree Inn at Westport at 8:30 A.M. for a day of railfanning in St. Louis, we finished around 2:30 P.M. Description: An Infrared image of a freight train descending the mountain at Horshoe Curve. Description: NS 6715 and 2516 rolling through Harrisburg, PA. Description: NS 6715 and 2516 hauling empty autoracks over the Rockville Bridge. Description: NS 6715 and 2516 hauling empty autoracks. 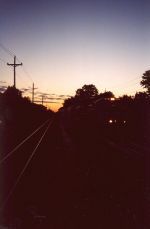 Description: An SD70 leads 19G west through Emmaus seen from the Fourth Street overpass.